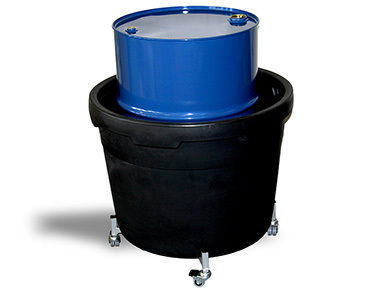 Do you find moving waste drums around your workshop a difficult and potentially dangerous operation? Often drums should be bunded to capture potential leaks…which in theory sounds even harder. Enter the humble single drum bund, along with its partner in crime, the mobile drum dolly. Used together, this simple yet powerful combination helps organise and contain your waste collection drums. And let’s not forget the all-important drum lifter, which attaches to a forklift and enables the safe and secure movement of 205 litre drums. A single drum bund can sit upon a customised drum dolly. This makes it much easier to wheel the drum about to collect waste oil. If the drum has an open top and is used for rags or other waste, such as metal filings, then it can be moved with ease about the workshop. So…how do I get full steel 205 ltr drums into the bund I hear you ask?? Answer: Using our simple forklift drum lifter for 205 litre drums. A forklift drum lifter enables the safe and secure movement of 200-205 litre drums. Until 15 April 2016, we’re offering our customers a 40% discount on the FDL1 forklift drum lifter. For more product information, simply click here.